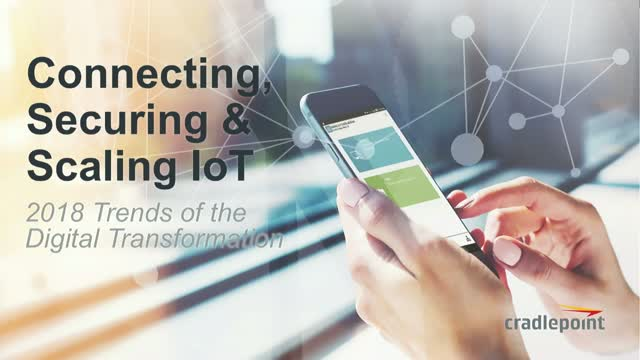 The rapid, ongoing growth of IoT is opening exciting new opportunities for seeing, measuring, controlling, and profiting from actions that take place within enterprises. In fact, 69 percent of organizations have adopted, or plan to adopt, IoT solutions within the next year, according to Cradlepoint’s new State of IoT 2018 report. That said, there’s a vast divide in the world of enterprise IoT between what businesses say they believe and how they plan to act. Join Ken Hosac, VP of IoT Strategy at Cradlepoint, for a live webinar on Dec. 20, 2017, at 8am PT, to explore brand-new data from the State of IoT 2018 report.